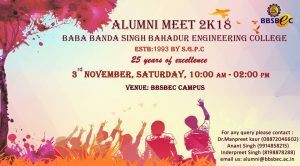 BBSBEC Annual Alumni Meet-2018 has been scheduled on 3rd November 2018 (Saturday). All Alumni are cordially invited to the event with their family. Convey to your batchmates, seniors, and juniors.